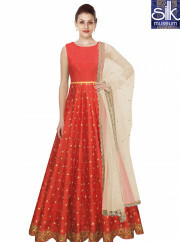 Women elegance is magnified tenfold in this style of a pink fancy fabric floor length anarkali suit. The pretty embroidered, lace and resham work a intensive characteristic of this attire. Comes with matching bottom and dupatta.